Everyone’s talking about the unpredictable weather, and this year they’re doing something about it. 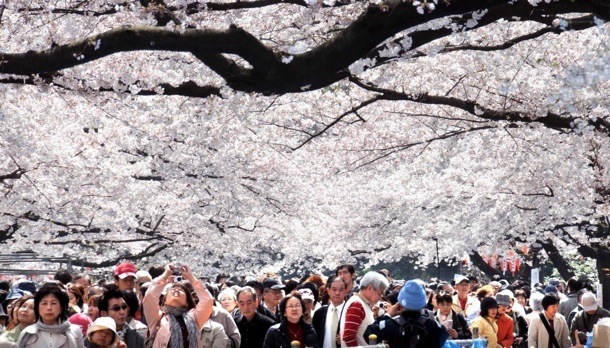 Crowd-sourced cherry blossom reports are taking the place of the official announcements that were put out by the Japan Meteorological Agency every year since 1955. 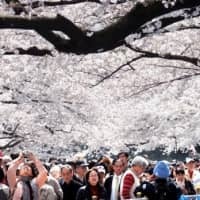 This year, the agency declared the beginning of the season by measuring a tree at Tokyo’s Yasukuni Shrine and ended the official predictions. This opened up the blossom-predicting business to private weather companies and Web sites. Several companies are competing to replace the official JMA blossom report, giving office-bound nature lovers plenty of options for desktop tree-tracking. Weathermap Sakura takes a scientific approach, with charts, graphs and indoorsy-looking columnists predicting peak bloom times. Weathermap’s sakura Twitter feed sends status reports on viewing spots, comparing this year’s full-bloom date to the historical average and last year’s date. Japanese portals Excite and Yahoo! both launched sakura sites this spring. Excite has info on 500 flower viewing spots around the country, and Yahoo! ups the ante with 1000. They have similar searchable information that includes the number of trees at each spot and supplements like picnic recipes, cherry blossom crafts and sweet shops near popular parks. Maps and data can be sent from a PC right to a cell phone from a one-click email box or QR code on each page. Both portals are packed with the one item more indispensable than portable hand warmers: user-generated content. Both have galleries of thousands of photos submitted by registered site members and blog posts about their blossom viewing experiences. The blossom information on Idoldog is also crowd-sourced — by dogs. Well, by their proud owners. Hover over the cherry blossom icons on the map to see photos of pets amid petals uploaded by users. These galleries may or may not lead to better blossom predictions, but they do provide an outlet for the millions of photos of the flowers people snap every year, macro lenses and tripods in tow. It kind of makes us wonder what people did with all the lovingly crafted pictures before there were so many places to upload and share them.